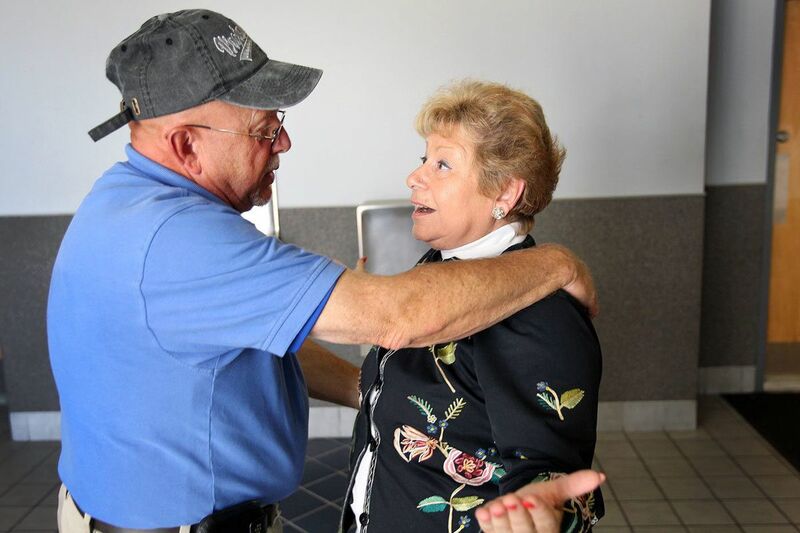 Teacher Michael Wetzel congratulates Rita C. Schwartz, president of Local 1776 of the Association of Catholic Teachers, after a ratification vote in 2011. For the first time since 2011, negotiations between the union that represents teachers at 17 Catholic high schools and the Archdiocese of Philadelphia have lingered into late August, and both sides are racing to make sure the academic year begins on time next week for more than 12,000 students. The teachers' current one-year contract expires at 12:01 a.m. Friday. "I don't have a crystal ball," Rita Schwartz, president of Local 1776 of the Association of Catholic Teachers, which represents 640 lay instructors, said Wednesday. "But as long as we're talking, I have to say we're hopeful." The first day of school for ninth graders is Wednesday, while 10th through 12th graders are scheduled to report next Thursday. Sept. 8 will be the first full day for all students. The archdiocesan high schools spread across the five-county region enrolled nearly 13,000 students in 2016-17. Kenneth A. Gavin, communications director for the archdiocese, said the Office of Catholic Education's negotiating team was "prepared to meet every day and throughout the coming weekend to arrive at an appropriate and equitable agreement so that the school year can begin as planned." The Association of Catholic Teachers has scheduled a general membership meeting for Tuesday to give its members an update on negotiations and a possible contract vote. Under the current agreement, a starting teacher earned $39,500 last year, a 20-year veteran made $53,780, and top of the scale was about $79,300. The last strike came in 2011, disrupting the first two weeks of that school year. High school students lost five instructional days and began the year with staggered orientation and testing days that were staffed by administrators, as well as nuns, brothers, and other members of religious communities. The sticking points during negotiations then were job security, working conditions, and the planned use of more part-time instructors. The three-year contract that ended the 2011 strike was followed by three one-year agreements that focused on salaries and benefits. Those contracts were settled before students left on their summer vacations so there was no uncertainty over the schools' opening in the fall. Schwartz, who has led the Catholic lay teachers' union for decades, said Wednesday that negotiators must wrap up talks on contract language, including working conditions, before they tackle salaries and benefits. Additional negotiating sessions are scheduled for Thursday, Sunday, and Monday. "I'm hoping that at the end of the negotiations we'll be able to bring back to the teachers a contract that we can ratify," she said. "I want schools to start on time and for the teachers and the kids to be in school." Schwartz said talks were taking longer this time because the archdiocese wanted to review the language of the entire contract, including long-standing provisions covering working conditions. She said the archdiocese is seeking changes that would give it more flexibility in managing teachers. Talks began in late March. In a statement, Gavin said the archdiocesan negotiators have proposed contract changes that "would lead to improvement in student achievement and the quality of academic program offerings." He also noted: "Education in the 21st century is changing at such a rapid pace that it is essential to have the ability to respond efficiently and effectively to the world around us so that our students thrive."